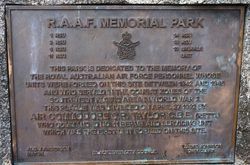 A park commemorates those who have served in the Royal Australian Air Force (R.A.A.F) in the various conflicts in which Australia has been involved. This Park Is Dedicated To The Memory Of The Royal Australian Air Force Personnel Whose Units Were Formed On This Site Between 1942 And 1945 And Who Served In The Combat Zones Of The South-West Pacific Area In World War 2. This Plaque Was Unveiled On April 27 1992 By Air Commodore C. R. Taylor C.B.E. (Ret`d) Who Commanded No. 11 Repair And Servicing Unit Which Was The First Unit Formed On This Cite.